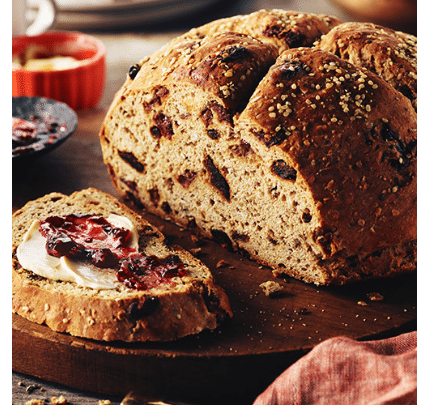 Stirring in dried fruit, such as the figs and cherries in this recipe, makes CBD hemp soda bread a particularly good match for cheese. Delicious in a cheese course, served with blue cheese, Gorgonzola, Asiago or aged Cheddar. Preheat oven to 375°F (190°C). Line baking sheet with parchment paper. Whisk together all-purpose flour, whole wheat flour, oats, 1/3 cup (75 mL) hemp, salt, baking powder and baking soda in large bowl. Whisk together buttermilk, CBD Hemp tincture and egg in another bowl; pour over flour mixture and stir until ragged dough forms. Add figs and cherries; stir until well mixed. Turn dough onto floured work surface; knead once or twice and form into a ball. Transfer to prepared baking sheet. Sprinkle top with 1 tsp (5 mL) hemp; press into dough, flattening into 7-inch (18 cm) round.. Mark top with shallow 4-inch (10 cm) long "x" using sharp knife. Bake 40 minutes or until bread is deep golden brown and sounds hollow when tapped on bottom. Let cool on rack 30 minutes before slicing.